« Ran Water All Weekend! Looks Like Rain For A Few Days! If our weather forecasters are correct, looks like we are in for some rain over the next three days. Thursday, Friday and Saturday are all showing over 75% chances for rain. That’s pretty good. Temperatures are going to take a nose dive on Saturday into the mid 50s. A bit chilly! After that, however, it’s back into the 70s and chances for rain are slim until Thursday next week and that is only a 30% chance. Generation has been a little spastic. No, not the schedules, but what they are doing compared to the schedules. So far this week, they have turned the generators on about two hours earlier than projected. I know, it’s only a projection. Anyway, it was supposed to be off today until 1:00 p.m. and I think it came on at 11:00 a.m.
either the Tiger Tail or the holographic green crackleback…..his favorite way to fish. We did get to observe one really neat thing while on the water. 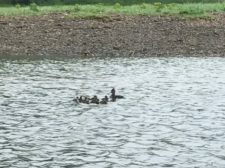 A mother hooded merganser was swimming by us with her ten ducklings close behind her when a bald eagle swooped down to try and take a duckling. Mother jumped up in the air making awful squawking sounds, even outdoing my yelling. With all the commotion, the eagle flew off without dinner! He sat up in a tree for a short period of time and must have swallowed his pride as he eventually flew away. 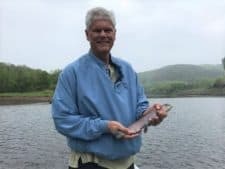 This entry was posted on Wednesday, April 19th, 2017 at 2:46 pm	and is filed under Fishing Reports. You can follow any responses to this entry through the RSS 2.0 feed. You can leave a response, or trackback from your own site.